The Case Against Saccharin: Weight Gain in 12-Wk Human Study Only W/ 1st Gen. Sweetener or Sucrose | Plus: Have You Noticed That Coke 'Secretly' Pulled it Only Recently? If you follow the SuppVersity and/or myself on Facebook, you will have seen my link to an interview with the author of the "artificial sweeteners" <> "stroke" study that made the headlines lately. In the interview, the lead author puts his results into perspective; a step that's absolutely missing from 99% of the press coverage ... worth reading, but unlike the study Tal Ben Moshe shared on the ISSN Facebook yesterday, not a new intervention study in living human beings - one that taught me several lessons in the history and spectrum of coke's sweetener compositions. Aspartame & Your Microbiome - Not a Problem? Sucralose 2018 Update #1 - Does it Make Us Fat? Sucralose Tricks 'Ur Energy Gauge - Implications? The study by Kelly A Higgins and Richard D Mattes from the Purdue University a compares the effects of the consumption of 4 low-calorie sweeteners (LCSs) and sucrose (=regular sugar) on body weight, ingestive behaviors, and glucose tolerance over a 12-wk intervention in adults (18–60 y old) with overweight or obesity (body mass index 25–40 kg/m2)... and it yielded intriguing results, of which the researchers rightly point out that "[i]f substantiated through additional testing and confirmed through mechanistic studies, findings from this trial have implications for consumers, clinicians, policymakers, and the food industry" (Higgins & Mattes 2019). Essentially the study demonstrates an obvious truth: One artificial sweetener is unlike the other. 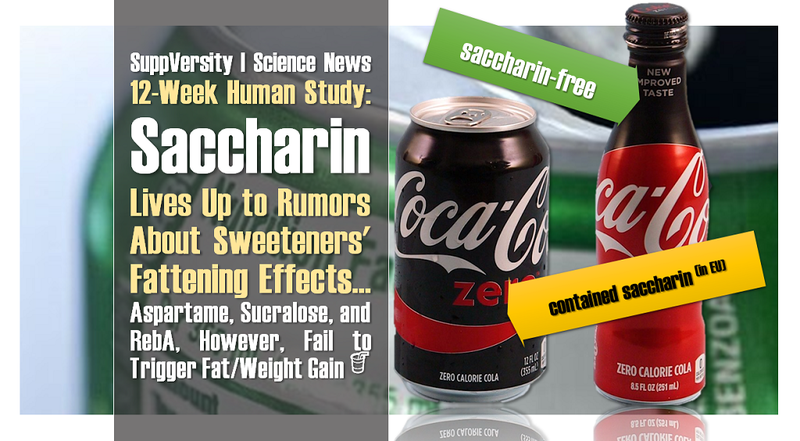 While the 21st-century sweeteners sucralose and stevia display the anticipated benefits, the big granddaddy of artificial sweeteners, saccharin, seems to do just what epidemiological data suggests: saccharin will fatten you up. Really? Well, not to the extent the media would have it: If you take a look at the statistically significant absolute fat gain in Figure 1 (left), it turns out that their practical relevance is questionable, as long as we don't know that the fat gain progresses at the same pace over years. Figure 1: Effects of 12 weeks on sucrose, saccharin, aspartame, RebA, and sucralose on total body fat (left, p = 0.032) and body fat percentage (right, p = 0.478 | Higgins 2019) - both are physiologically irrelevant for people at >37% body fat. But there's more: Only the effects on total body weight in Figure 2 were statistically significant. 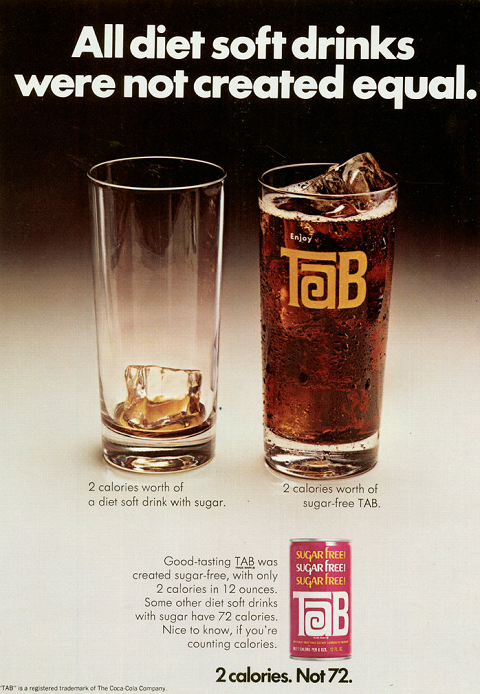 The much more (health) relevant body fat % was not affected significantly by any of the four artificially sweetened beverages (p = 0.478). LCS classic ➡ Saccharin is one of the least expensive LCS and, together with the similarly cheap cyclamate, it still constitutes the lion's share of LCS consumption worldwide (Sylvetsky 2016) - saccharin is the worldwide market leader based on sucrose equivalents and has a particularly strong presence in the tabletop packet market, primarily as Sweet ‘N’ Low™" (ibid). 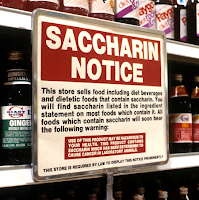 Saccharin has an interesting history in the US with it being banned temporarily in the 1980s (that was the end of Coca Cola's T@b diet soda), being stigmatized with a "could cause cancer"-label in the late 1980s and early 1990s and finally being exonerated in 2000 (FDA). 'Exonerated' for a good reason? Well, the study at hand doesn't tell you anything about saccharin's carcinogenic effects as they were described by Cohen et al. (1986), but follow-up studies to the 80s research was unable to confirm the carcinogenic effects that were observed in early rodent studies... follow-up studies in monkeys that lasted up to 24 years. This doesn't mean that the scientists' previously cited conclusion that the "findings from this trial have implications for consumers, clinicians, policymakers, and the food industry"... in 12 weeks, however, the physiological relevance of LCS consumption in overweight and obese individuals is somewhere between 'irrelevant' and 'of questionable relevance'. Clearly, more actual research (no observational fortune-telling) is necessary to make firm conclusions with regard to the individual effects of specific types of artificial sweeteners on body weight and composition; but that's not 'news'. What is news or, as some may argue, the previously ignored 'elephant in the room', is the observation that the "beneficial effects of one LCS (e.g., sucralose) may be attenuated if combined with selected other LCSs," (Higgins 2019). Figure 2: If you look at the 12-week body weight changes things don't look that impressive either - of particular importance: only the sugar group saw something akin to statistically significant linear weight gain (Higgins 2019). IMHO this is the actually relevant 'news' the study at hand provides. Why's that? Well, the vast majority of products use combinations of various artificial sweeteners - products that are based on a single LCS are the exception, not the rule; and an ever-increasing number of products seeks to achieve a "more natural", sugar-like taste by combining three or more sweeteners (e.g. Coke Zero - 58 mg aspartame, 31 mg acesulfame-K, and 38 mg sucralose). 🤷‍♂️ Do you remember my 2016 article about the putative (interactive) effects of common food additives on diet sodas' effect on blood glucose management? No? Read it! Let's briefly recap: The scientists started with the contemporary inconsistency of experimental research and observation, they recruited 154 pretty fat (>35% body fat) young-to-middle-aged men and women (18-16y), assessed the subjects food intake on 2x3 days (2 nonconsecutive weekdays and 1 weekend day) at the beginning and end of the 12 week intervention phase, respectively. intake, EE, appetite, and glycemia as its main outcomes, excluded anyone who used artificial sweeteners regularly, i.e. more than once per week. You don't remember the 'saccharin can give you cancer'-signs? You're either a European, a Millenial, or younger. The FDA pulled the cancer warning for saccharin in 2000. Where do you find all the (natrium)saccharin that's used globally? Well, you will be surprised to hear that, but your risk of being exposed is much lower in the US than elsewhere 😲. After Coca Cola and Co had to label both, the presence and amount of the sweetener that's disguised as E 954 in the EU, in the 1980s-90s, they the companies pulled the plug on the no-longer-marketable artificial sweetener (Note: Its cousin, E 952, aka cyclamate, has even been banned from the US market due to potentially carcinogenic effects and is still used widely in the EU). Neither of these measures was taken in the EU, where Coca Cola ab-)used the lack of regulation and consumer-awareness until recently; 'recently' as in when they pulled the plug on Coke Zero, and the other "Zero" products. Coca Cola pulled it, US producers have avoided it ever since manufacturers had to label it as carcinogen in the late 20th century, only the European food and supplement industry has always loved and still loves its saccharin aka "E954"! Things look different for supplements, though. Protein supplements, for example, often contain saccharin and, in Europe, cyclamate. So, you better check your supplement labels! At least those of you who buy European products will likely find both sodium-/natriumsaccharin (E954) and cyclamate (E952) on the label. Why? Well, mixing only "modern" sweeteners will not yield the "clean" sugary taste consumers are looking for - at least not until exceeds the consumers' maximal sweetness threshold (Heikel 2012). Other reasons to stick to the 1st generation sweeteners are their solubility, their effects on the texture of the final product, their heat stability etc. (Hutteau 1998). body weight: while there was a significant treatment-by-time effect (P = 0.01) for weight, only the sugar- and saccharin-guzzling group recorded significant weight gain. There was no statistically significant difference between the sugary and the saccharin sweetened beverages, but the "gains" were more consistent and marginally larger in the "sugar" (=sucrose) group (weight change = 1.85 ± 0.36 kg, P < 0.001; 1.18 ± 0.36 kg, P = 0.02, respectively | Figure 2). As you will have seen in Figures 1 & 2, already, the subjects in the aspartame and rebA groups also gained some weight over the 12-week study: a non-significant 0.73 ± 0.35 kg and 0.60 ± 0.36 kg, respectively. Sucralose, currently the most-vilified sweetener, on the other hand, delivered on the weight loss promises attributes like "diet" or "no sugar" on the packaging of artificially sweetened products imply... well, they 'delivered' a non-significant (P ≥ 0.07) reduction of body weight of −0.78 ± 0.36 kg - needless to say that the associated <1% reduction in body fat didn't turn the heavy-weight couch potatoes into fashion models. the already small increase in the fat depots around the waist didn't differ between sweetener groups; the gynoid fat which forms around the hips, breasts and thigh, on the other hand, increased more rapidly in the saccharin vs. rebA and sucralose groups [+0.18 ± 0.06 kg for both rebA (P = 0.006) and sucralose (P = 0.005)]. Just like the body weight changes, these changes in body composition did not correlate with baseline body weight (Figure 1 uses the corrected data, already). The same (no effect of initial body weight/composition) held true for the subjects' fat-free mass (FMM), of which the scientists report increases all but the sucralose group (+0.84 ± 0.20 kg, P = 0.001 for sucrose; +0.70 ± 0.18 kg, P = 0.006 for saccharin; +0.63 ± 0.18 kg, P = 0.01 for aspartame). A clear pattern, however, cannot be distinguished. the energy intake was significantly higher for the sucrose group than for the saccharin, rebA, and sucralose treatment groups (P ≤ 0.004) and only tended to be greater than the aspartame treatment group (P = 0.07). when the energy provided by the beverage is removed from the reported energy intake, the treatment, and treatment-by-time main and interaction effects are no longer statistically significant (P = 0.37 and 0.96, respectively). In this context, it's certainly worth mentioning that a significant inter-group difference for the LCS was not observed for either the total or the adjusted intakes when saccharin, aspartame, rebA, and sucralose were compared. How reliable is the data? You already know that the scientists' adjustments for baseline weight didn't make a difference. Hence, it's unlikely that a rule of thumb like "the fatter, the better/worse" exists. But what about other typical confounders? Misreporting of dietary intakes, for example? Well, with "only 14.2% of the mean reported energy intakes [falling] within the Goldberg cutoffs", the scientists were quite happy with their subjects' ability (and willingness) to use their “Automated Self-Administered 24-hour Dietary Recall” (ASA24) correctly. Potential confounding due to ineffective blinding is possible and most likely for aspartame (69% v. 50-57% of the subjects in the aspartame group correctly assumed that they had consumed LCS). None of these numbers is yet far enough off the 50% that would signify that the subjects were absolutely clueless as to which drink they had been given (the sucrose drink was correctly identified by only 42%). The observed effects can thus neither be blamed on the distinctive(ly chemical) taste of any of the sweeteners or being able to say if one's beverage was sweetened with sugar or LCS, as the likelihood of correctly identifying the beverage sweetener was not different between treatment groups (P = 0.44). For the physical activity and energy expenditure (EE), the scientists also found "no significant treatment effect or treatment-by-time interaction" (P = 0.56 and 0.17, respectively)" (ibid.) - this goes for all aspects of the Baecke index for work, sport, or leisure physical activity (P ≥ 0.05) and was to be expected in the absence of an exercise intervention. In other words: Irrespective of whether the energy from the beverages was included or not, there was no effect of the type of LCS on the subjects' energy intake "at any time point" (ibid.). That is intriguing as the subjects in the saccharin group reported significantly greater hunger ratings than all other treatment groups (P ≤ 0.03); and, in a similar vein, the subjects in the saccharin group were the only ones to report an increased desire to eat (DTE) and prospective consumption ratings. The authors summarize their own results as follows: "Sucrose and saccharin consumption significantly increased body weight compared with aspartame, rebA, and sucralose and weight change was directionally negative and lower for sucralose compared with saccharin, aspartame, and rebA" (ibid.) For the Purdue University researchers, the most important message is yet not that the subjects gained weight, but rather that it's unwarranted to study LCSs as a group, when each of them seems to have individual effects. ... that saccharin, aspartame, sucralose, and rebA lack the often claimed effect on energy balance: the scientists were unable to detect the consistent increase in energy intake sweetener - in that, it's particularly important to highlight once more that a significant increase in energy intake was not observed in the saccharin group, either... or, as the scientists have it: "no association between energy intake and saccharin use was observed despite increases in hunger, DTE, and prospective consumption" (Higgins & Mattes 2019). Accordingly, we must assume that there were "metabolic changes unrelated to energy intake" (Higgins & Mattes 2019). So what could be the explanation? insulin & glucose management: The results of studies assessing the effects of saccharin on our cephalic phase insulin response (CPIR) is inconsistent, compared to studies in other sweeteners it does yet seem more likely for saccharin to trigger/modulate the insulin response than for any other sweetener. So, is it insulin? Not impossible, but not proven either... and the lack of effect on the subjects' response to the oral glucose test (glucose AUC and insulin release didn't differ) makes it seem unlikely that insulin mediates either the increased desire to eat and weight gain in the saccharin group of the 12-week study at hand. dissociation between taste and energy content: The aforementioned changes in insulin could, if they are accompanied by corresponding changes in GIP, GLP, PYY and other 'satiety hormones' mess with our bodies' ability to guesstimate the true energy content of foods. If that was the case, though, we should see significantly increased intakes in the study at hand - that those were not measured in spite of the presence of increased hunger, could yet be a result of underreporting - no matter what the scientists' analysis using the Goldberg criteria. No, it's not clear that 'this is the nasty effect on the microbiome'. I've addressed the fearmongering news about sweeteners interactions with the microbiome before (Moussa 2015; Moussa 2017) and am not going to do that again. If it even exists, it would not be saccharin-specific, though, since even your "holy stevia" will mess with the composition of your gut microbiota. Indeed, a saccharin-specific effect as it occurred in the study at hand rather provides further evidence that general LCS-triggered changes in the microbiome are not the missing metabolic link to explain the observational link between sweetener intake and diabesity. leaky gut: As previously pointed out, it is unlikely that the weight gain was mediated by saccharin-specific changes in the gut microbiome. Only recently, though, Santos et al. (2018) have been able to show that, in contrast to acesulfame K, aspartame, and sucralose, saccharin seems to possess the nasty ability to reduce the integrity of the human gut integrity by "[increasing] paracellular permeability and decreas[ing the] transepithelial electrical resistance (TEER) via a non-cytotoxic mechanism" (Santos 2018). Figure 3: Saccharin has uniquely detrimental effects on the transepithelial electrical resistance (TEER, let) in Caco-2 monolayers and increases the amount of FITC-dextran that leaked into the scientists' petri-dish guts through the Caco-2 cell layer that simulates your gut lining into the lower compartment of the culture (Santos 2018). The underlying mechanism here is, as you would expect it, inflammation, with saccharin elevating the NF-κB activation in the Caco-2 cells of the gut lining which will, in turn, initiate the ubiquitination of the tight junction protein claudin-1 and the subsequent breakdown of the (simulated) gut lining. "[t]he present findings are consistent with the positive association in epidemiological and rodent trials [which c]ollectively suggests [that] saccharin stands apart from the other popular LCSs in that it may actually contribute to weight gain" (Higgins & Mattes 2019). "[...] other health outcomes often related to adiposity, such as glucose tolerance or serum lipid concentrations, were also nonsignificant" (Higgins & Mattes 2019). If that would stay this way in a long(er)-term studies, is one out of many questions future studies will have to address; studies that should also follow up on the potential weight loss effect of sucralose, by the way - we shouldn't forget, after all, that the consumption of this dreaded 3rd generation sweetener did not significantly alter body weight from baseline, but it was the only sweetener to trigger a measurable downward trend in body weight in the study at hand. What I have learned writing this article is that it's not really easy to find out if you were, have been, or are exposed to saccharin, because the answer depends not just on the products you consume, but also on (a) whether you bought them in the US or Europe, (b) if they have been formulated before the year 2000 or after manu-facturers were no longer required to put the carcinogen warning on saccharin containing products in the US, and (c) if you consume Coke Zero from discounters like ALDI and other copy cats or the new original Coke Zero Sugar of which I realized only after doing a lot of research that (03/19) it does no longer contain saccharin... neither in the US, nor in Europe...🤔 So, does that mean that I believe that saccharine makes you fat and gives you cancer? Not really, even with the publication of the study under review there's not enough evidence to substantiate the claim that saccharin (let alone other LCSs) fuel the global diabesity epidemic. So what's the verdict then? Firstly, Higgins' & Mattes' paper exonerates sucralose and rebaudioside A. For the former, the study results even suggest beneficial effects on weight and body fat in the absence of dietary or other lifestyle change. This does, however, require confirmation from longer-term studies in a metabolically (+body-composition-wise) more diverse population. Secondly, the results Higgins & Mattes present implicate saccharin, one of the "first generation" sweeteners. That's interesting because it seems to support my non-systematic cumulative review of the evidence regarding the link between artificial sweeteners and body weight gain, where - even among the rodent studies - those using saccharin seemed more likely to detect an effect than (e.g.) those using aspartame or sucralose. This leads us to the third take-home message, which is that the study adds to the evidence that not all sweeteners are created the same. As obvious as that may be, self-proclaimed "experts" still tend to lump them all together into one category of 'sweet poison' you have to avoid at all costs - whenever you read something like that or, even worse, statements like "Stevia is ok, because it is 'natural' but all the rest is 'chemical' poison", you better treat what you've just read like you should treat the stuff on naturalnews.com and the other pseudo-science websites: 🚮. With that being said: Your final question probably is - "Will saccharine make me fat?" I am sorry to say that but if I answered this question with a simple yes or no, you'd have to trash this article, as well. The paper by Higgins & Mattes has added to the evidence that it could do, however, the only mechanistic explanation the study offers (increased appetite) is, at the same time, refuted by the scientists' observation that the energy intake didn't change significantly in response to saccharine. This leaves us with the new "leaky gut" by Santos et al. and a potentially individual increase in inflammation that could promote weight gain even in the absence of significant changes in energy intake | Leave a comment on Facebook! Baecke, Jos AH, Jan Burema, and J. ER Fronlijters. "A short questionnaire for the measurement of habitual physical activity in epidemiological studies." The American journal of clinical nutrition 36.5 (1982): 936-942. Heikel, Barbara, et al. "Optimizing synergism of binary mixtures of selected alternative sweeteners." 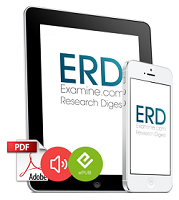 Journal of Sensory Studies 27.5 (2012): 295-303. Higgins, Kelly A & Mattes, Richard D. "A randomized controlled trial contrasting the effects of 4 low-calorie sweeteners and sucrose on body weight in adults with overweight or obesity." The American Journal of Clinical Nutrition (2019): nqy381. Hutteau, F., et al. "Physicochemical and psychophysical characteristics of binary mixtures of bulk and intense sweeteners." Food Chemistry 63.1 (1998): 9-16. Malhotra, Rahul, et al. "Young adult weight trajectories through midlife by body mass category." Obesity 21.9 (2013): 1923-1934. Sharma, Rashmi S., et al. "Effects of para-aminobenzoic acid (PABA) form and administration mode on PABA recovery in 24-hour urine collections." Journal of the Academy of Nutrition and Dietetics 114.3 (2014): 457-463. Suez, Jotham, et al. "Artificial sweeteners induce glucose intolerance by altering the gut microbiota." Nature 514.7521 (2014): 181. Sylvetsky, Allison C., and Kristina I. Rother. "Trends in the consumption of low-calorie sweeteners." Physiology & behavior 164 (2016): 446-450.